While we are shivering during times of extreme cold and making sure we wear enough clothes when we go outside, are we making sure the pipes in our home are afforded the same kind of protection? When liquids freeze, they expand. 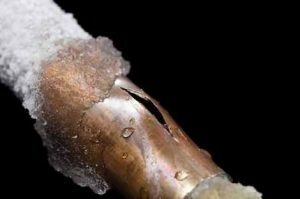 When water freezes in a pipe, it can cause extensive damage. If the main pipe feeding water to our home freezes, we will know right away. However, we may not realize some pipes are frozen until the weather begins to warm. For example, if the pipe going to your outside spigot freezes and the pipe just inside your home freezes and cracks, you may not find out until days later when your basement begins to fill with water. So what can you do to help avoid frozen pipes? One of the first steps is to insulate pipes located in a crawl space or attic. You can use pipe sleeves, heat tape, or heat cables on exposed water pipes. Caulking or insulating cracked seals around pipes will also reduce the chance for subzero air to freeze the water in your pipes. If you have exposed pipes or pipes close to exterior walls, open cabinet doors leading to them to allow warm air to circulate. Use an indoor shut-off valve to drain water from pipes leading to outdoor faucets and disconnect any hoses attached to your spigots. You can also talk to a plumber about installing “freeze proof” outdoor faucets. Many people lower their thermostat at night to reduce heating costs. If it’s extremely cold, keep your thermostat at the same temperature day and night to maintain a higher temperature throughout the nighttime hours. Even if you take every precaution, sometimes disaster will hit and you can experience a broken pipe. If this happens to you, don’t panic and take the following actions. The first thing you want to do is turn off your water at the main shut-off valve in the house – IF there is no electrical danger. If you are not sure where the shut-off valve is, familiarize yourself with its location and remove potential electrocution risks nearby. Once you have turned off the main shut-off valve, turn on your water faucets and leave them on. Contact RestorePro at 877-594-9125 to begin the clean-up process as soon as possible. Most insurance companies require you to take this action to prevent additional damage to your home. Call a plumber or have RestorePro do so to arrange an inspection and pipe repair so you can resume using your water as soon as possible. Please remember to never use any type of electrical appliance or equipment in standing water. This could be deadly. The next time you hear of extreme cold weather coming into town, don’t just check your closet to make sure you have a warm coat, hat, and gloves. Check your water pipes to assure they are properly protected as well. A few small steps could help you avoid thousands of dollars in damage to your home and your belongings.